"Olympiacos" redirects here. For other uses, see Olympiacos (disambiguation). Olympiacos Sindesmos Filathlon Pireos (Greek: Ολυμπιακός Σύνδεσμος Φιλάθλων Πειραιώς, Olympic Club of Fans of Piraeus) is a major multi-sport club based in Piraeus, Greece. Olympiacos is parent to a number of different competitive departments including Football, Basketball, Volleyball, Water Polo, Handball, Athletics, Swimming, Sailing and Table Tennis amongst many others, which have won numerous European and domestic titles over the club's history. Olympiacos CFP is one of the most successful and decorated multi-sport clubs in Europe, being the only Greek club, as well as one of the few European multi-sport clubs to have won as much as 15 International titles –including 13 major European titles, 1 Intercontinental title and 1 Balkan title– in five sports (Football, Basketball, Volleyball, Water Polo, Wrestling) (no other Greek club have won more than six European titles). Overall, Olympiacos is the most successful Greek multi-sport club in terms of International titles won (15), European titles won (13), participations in European and International finals (37 –15 times Champions, 22 times Runners-up–) and the only Greek multi-sport club to have won European titles in different team sports (Basketball, Volleyball, Water Polo). They have won European titles with six of their sports departments (Men's Basketball, Men's Volleyball, Women's Volleyball, Men's Water Polo, Women's Water Polo, Men's Wrestling), while no other multi-sport club in Greece has more than two European title-winning sports departments. With the Balkans Cup won by Olympiacos Football Team in 1963, the Red-Whites became the first ever Greek club to win an international competition in any sport. Specifically, Olympiacos Football Team has won 1 Balkans Cup (1963), Olympiacos Men's Basketball Team have won 3 Euroleagues (1997, 2012, 2013) and 1 FIBA Intercontinental Cup (2013), Olympiacos Men's Volleyball Team have won 2 CEV Cups (1996, 2005), Olympiacos Women's Volleyball Team have won 1 CEV Challenge Cup (2018), Olympiacos Men's Water Polo Team have won 2 LEN Champions Leagues (2002, 2018), and 1 LEN Super Cup (2002), Olympiacos Women's Water Polo Team have won 1 LEN Euroleague (2015), 1 LEN Super Cup (2015) and 1 LEN Trophy (2014) and Olympiacos Men's Wrestling Team has won 1 European Cela Cup (2006). In total, Olympiacos departments (Football, Basketball, Volleyball, Water Polo, Wrestling) have reached 36 times the final (15 times Champions, 21 times Runners-up) of the most prestigious and important European and Worldwide competitions, which is an all-time record for a Greek multi-sport club. The club has also won the Triple Crown in Men's Basketball in 1997 (FIBA Euroleague, Greek League, Greek Cup), two Quadruple Crowns in 2002 and 2018 in Men's Water Polo (2002 LEN Chanpions League, 2002 LEN Super Cup, 2002 Greek Championship, 2002 Greek Cup – 2018 LEN Chanpions League, 2018 Greek Championship, 2018 Greek Cup, 2018 Greek Super Cup), the continental Treble in Women's Water Polo in 2015 (LEN Euroleague, LEN Super Cup, Greek Championship), as well as a continental Treble in Women's Volleyball in 2018 (CEV Challenge Cup, Greek Championship, Greek Cup). With the 2002 achievement, Olympiacos Men's Water Polo Team became the first club ever in Water polo history (since the establishment of the modern Champions League format in 1996) to win four out of four competitions in a single year, thus completing the quadruple. After the 2015 LEN Euroleague win of Olympiacos Women's Water Polo Team, Olympiacos CFP became the only multi-sport club in European Water Polo history after Pro Recco to have been crowned European Champions with both its men's and women's departments, and the only one with both its departments currently active (Pro Recco Women's department has been dissolved since 2012). A similar impressive feat was achieved by Olympiacos CFP in another team sport in 2018: after the 2017–18 CEV Women's Challenge Cup win of Olympiacos Women's Volleyball department, Olympiacos CFP become the only multi-sport club in Greece and one of the very few in European volleyball history to have won European titles with both its men's and women's departments. Olympiacos Men's Basketball Team won their third Euroleague title in 2013 and became the first and only Greek club, and only the third club in European basketball history, to become back-to-back European champions in the modern Final Four era of the Euroleague, after beating Real Madrid 100–88 in the final of the 2012–13 Euroleague Final Four in London. Olympiacos CFP has nurtured some of the greatest Greek athletes. Olympiacos' athletes have become Olympic medal winners, as well as World and European champions, while they are constantly chosen to be part of the Greek national teams. The club maintains Academies with state of the art training facilities, where thousands of children have the opportunity to practice and learn the secrets of sports. Overall, Olympiacos CFP have granted Greek sports and the club itself numerous Olympic, Worldwide and European honours. Olympiacos had 30 of its athletes and coaches from nine of its sports departments participating in the 2016 Olympic Games in Rio. Olympiacos is the most popular Greek club with around four million fans inside Greece and millions of others in the Greek communities all over the world. As of April 2006, Olympiacos has 83,000 registered members and it's placed in the top ten of the clubs with the most paying members in the world, holding the ninth place just ahead of Real Madrid. In 2014, that figure increased and the team boasts 98,000 registered members. Olympiacos CFP was the first Greek club that made it possible for its fans to become members, and granted them the right of voting for the board of directors. Olympiacos CFP was founded on March 10, 1925 in Piraeus, as a football club initially, and the club's aim, as stated in the statutes, is the systematic cultivation and development of its athletes’ possibilities for participation in athletic competitions, the spreading of the Olympic athletic ideal and the promotion of sportsmanship and fanship among the youth according to egalitarian principles, by stressing a healthy, ethical and social basis as its foundation. Members of "Piraikos Podosfairikos Omilos FC" (Sport and Football Club of Piraeus) and "Piraeus Fans Club FC" decided, during a historical assembly, to dissolve the two clubs in order to establish a new unified one, which would bring this new vision and dynamic to the community. Notis Kamperos, a senior officer of the Hellenic Navy, proposed the name Olympiacos and the profile of a laurel-crowned Olympic winner as the emblem of the new club. Michalis Manouskos, a prominent Piraeus industrialist, expanded the name to its complete and current status, Olympiacos Syndesmos Filathlon Pireos, a name that symbolizes and encompasses the morality, the honour, the vying, the splendor, the sportsmanship and the fair play value of the Olympic ideal of Ancient Greece, which was totally consistent with the club's emblem. Besides Kamperos and Manouskos, among the most notable founding members were Stavros Maragoudakis, the Post Office director, Nikos Andronikos, a merchant, Dimitrios Sklias, a Hellenic Army officer, Nikolaos Zacharias, an attorney, Athanasios Mermigas, a notary public, Kostas Klidouchakis, who became the first goalkeeper in the club's history, Ioannis Kekkes, a stockbroker, and above all, the Andrianopoulos family. Andrianopoulos, a family of well-established Piraeus merchants, played a pivotal role in the founding of Olympiacos. The five brothers, Yiannis, Giorgos, Dinos, Vassilis and Leonidas Andrianopoulos raised the reputation of the club and brought it to its current glory. 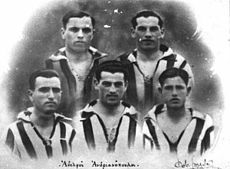 Yiannis, Giorgos, Dinos and Vassilis were the first to play, while Leonidas, the youngest of the five, made his debut later on and played for the club for eight years (1927–1935). The club's offensive line, made up of the five brothers, became legendary, rising to a mythical status and soon Olympiacos gained enormous popularity and became the most successful and well-supported club in Greece. Olympiacos is also known as Thrylos (The Legend), after the legendary, classic side of the 1950s which won a hatful of titles. Olympiacos football team is the most successful club in Greek football history, having won 44 League titles, 27 Cups and 4 Super Cups, all records. Τotalling 75 national trophies, Olympiacos is 9th in the world in total titles won by a football club. The club's dominating success can be further evidenced by the fact that all other Greek clubs have won a combined total of 38 League titles, while Olympiacos also holds the record for the most consecutive Greek League titles won, with seven in a row in two occasions (1997–2003 and 2011–2017), breaking their own previous record of six consecutive wins in the 1950s (1954–1959), when Olympiacos was unequivocally nicknamed Thrylos (Greek: Θρύλος, "The Legend"). Having won the 2014–15 league title, Olympiacos became the only football club in the world to have won a series of five or more consecutive championships for five times in their history, a record that was praised by FIFA with a congratulatory letter of its president, Sepp Blatter. They are also the only Greek club to have won five consecutive national Cups (1957–1961), as well as six League titles undefeated (1937, 1938, 1948, 1951, 1954, 1955). Olympiacos are one of only three clubs to have never been relegated from the top flight of Greek football, and by winning the 2012–13 title, their 40th in total, they added a fourth star above their crest, each one representing 10 League titles. In European competitions, Olympiacos best performances are their presence in the UEFA Champions League quarter-finals in 1998–99, losing the semi-final spot in the last minutes of their second leg match against Juventus, as well as in the UEFA Cup Winners' Cup quarter-finals in 1992–93. The Red-Whites are the highest ranked Greek club in the UEFA rankings, occupying the 29th place in Europe as of 2018, and one of the founding members of the European Club Association. Olympiacos won the Balkans Cup in 1963, at a time when the competition was considered the second most important in the region after the European Cup, becoming the first ever Greek club to win an international competition. Olympiacos men's basketball team is one of the most successful clubs in European basketball, having won three Euroleague Championships, one Triple Crown, one Intercontinental Cup, twelve Greek Championships and nine Greek Cups. They are a traditional powerhouse of the Euroleague and besides their three European Championship titles (1997, 2012, 2013), they have also been five times Euroleague runners-up (1994, 1995, 2010, 2015, 2017) and have participated, altogether, in ten Euroleague Final Fours (1994, 1995, 1997, 1999, 2009, 2010, 2012, 2013, 2015, 2017). From 2006 to 2015, Olympiacos qualified 10 times in a row for at least the quarter-finals of the EuroLeague, which was an all-time record in European basketball history at the time, shared with FC Barcelona, who made a new record in 2016. They play their home matches at Peace and Friendship Stadium. They are the first Greek club that ever played in a Euroleague Final (1994), and they won their first Euroleague title in 1997, achieving the first Triple Crown ever for a Greek team. As European champions, Olympiacos played in the 1997 McDonald's Championship and reached the final of the tournament, where they met Michael Jordan's NBA champions, the Chicago Bulls. Based on all those achievements, FIBA declared Olympiacos as the Best European Team of the 1990s. In 2012, they won their second Euroleague title in Istanbul by rallying from 19 points down in the championship game to beat CSKA Moscow 62–61 on the last shot of the game, achieving the greatest comeback in European basketball finals history, and one of the greatest ever seen in continental basketball. In 2013, Olympiacos won their third Euroleague title and became the first and only Greek club, and only the third club in European basketball history, to become back-to-back European champions in the modern Final Four era of the Euroleague, after beating Real Madrid 100–88 in the final of the 2012–13 Euroleague Final Four in London. After winning back-to-back EuroLeague championships, Olympiacos won the Intercontinental Cup and celebrated a third international title in less than 2 years. Domestically, Olympiacos have won 12 Greek League titles, 9 Greek Cups and 4 Doubles. They dominated Greek basketball during the decade of the 90s, when Greek Basket League was considered Europe's best professional league. Olympiacos men's volleyball team is the most successful club in Greek volleyball history, having won 28 Greek Volley League titles, 16 Cups, 6 League Cups, all national records, and 2 Super Cups. They are the only volleyball club in Greece to have won a European competition, with 2 CEV Cup Winners' Cup/CEV Top Teams Cups (1996, 2005), and a traditional powerhouse in European volleyball, having been runners-up in all three main CEV competitions, two times in the CEV Champions League (with seven final four participations), two in the CEV Cup and one in the CEV Challenge Cup, totalling seven European finals. Domestically, Olympiacos holds the record for the most consecutive championships won, with eight in a row (1987–1994), and for winning seven championships undefeated (1968, 1974, 1979, 1981, 1988, 1991, 2018). Internationally, their most successful period was between 1992 and 2005, when they came to be included amongst the top volleyball powers in Europe. During this period, apart from their two European trophies, they progressed to eleven final fours in total, seven of them consecutive between 1992–1998 (the first four in the CEV Champions League and the next three in the CEV Cup Winners' Cup); they also won a fourth place in the CEV Super Cup and a third in the FIVB Volleyball Men's Club World Championship. Olympiacos came to European prominence again by playing in the 2017–18 CEV Challenge Cup final; at the same time, the women's department won their respective 2017–18 CEV Women's Challenge Cup. In this way, Olympiacos became the first volleyball club that had men and women playing simultaneously in European finals, and one of the very few to have won European trophies in both departments. Olympiacos men's water polo team is one of the most successful teams in Europe and a traditional powerhouse of continental water polo, having won 2 LEN Champions Leagues (2001–02, 2017–18), 1 LEN Super Cup (2002) and 2 Triple Crowns (2002, 2018), the only Greek club to have been crowned European Champions. They have also been five times runners-up (counting eight European finals overall), two in the LEN Champions League (2000–01, 2015–16), two in the LEN Cup Winners' Cup (1997–98, 1998–99) and one more in the LEN Super Cup (2018). In 2001–02, Olympiacos became the first club ever in waterpolo history to win all four competitions they claimed (LEN Champions League, LEN Super Cup, Greek League and Greek Cup), completing a Continental Quadruple. They won their second Continental Quadruple in 2017–18 season (LEN Champions League, Greek League, Greek Cup, Greek Super Cup). After the 2014–15 LEN Euro League win of the women's department, parent club Olympiacos CFP became the second sports club in continental waterpolo history to have been crowned European Champions with both its men's and women's teams. Domestically, Olympiacos is the most titled club in Greek water polo history, as the club's 55 domestic titles (58 overall) are the most out of any Greek club. They have won 32 League titles, a record 20 Cups, a record 3 Super Cups and a record 16 Doubles. They are the dominant force since 1992, having set a number of records including an ongoing winning streak in both the Greek League's regular season and play-offs since May 2013. Olympiacos women's water polo team is one of the most successful clubs in Europe and a traditional powerhouse of continental water polo, having won the LEN Euroleague in 2015, the LEN Super Cup also in 2015 and the LEN Trophy in 2014 and having, overall, a commanding presence in European competitions. Besides their LEN Euroleague, LEN Super Cup and LEN Trophy titles, they were runners-up of the LEN Euroleague in 2017, runners-up of the LEN Super Cup in 2014, runners-up of the LEN Trophy in 2008 and 2018 and they have participated, altogether, in 6 Champions' Cup / Euroleague Final Fours (1996, 2010, 2011, 2015, 2016, 2017), as well as in 5 LEN Trophy Final Fours (2001, 2007, 2008, 2014, 2018), being semi-finalists of the same competition in 2009 and 2012. Domestically, Olympiacos have won 9 Greek Championships, a record 1 Greek Cup and a record 1 Double. They also hold the all-time record for the most consecutive Greek Championships, as they are the only team to have won 5 consecutive Greek Championship titles (2014–2018). In 2014 Olympiacos won the LEN Trophy in the Final Four in Florence, beating home team Firenze 10–9 in the final. One year later, Olympiacos were crowned European Champions, winning the LEN Euroleague in the 2015 Final Four in Piraeus, after a thrilling, hard-fought 10–9 win in the final against the then-reigning champions Sabadell, who were undefeated for more than 3 years with 115 consecutive wins in all competitions. Olympiacos lifted the LEN Euroleague title undefeated and having won 8 straight matches without even a single draw. As European Champions, Olympiacos participated in the final of the 2015 LEN Super Cup and won the title after a 10–6 win against Plebiscito Padova, thus completing a continental Treble in 2015 (LEN Euroleague, LEN Super Cup, Greek Championship), winning season's all three available titles. After the 2015 LEN Euroleague win of Olympiacos Women's Water Polo team, Olympiacos CFP became the only multi-sport club in European Water Polo history after Pro Recco to have been crowned European Champions with both its Men's and Women's departments and the only club with both its departments currently active (Pro Recco Women's department has been dissolved since 2012). Olympiacos women's volleyball team is one of the most successful volleyball clubs in Greece and the country's most successful in European competitions, having won 6 League titles, a record 9 Cups, a record 6 Doubles, a CEV Challenge Cup (2018) and a Continental Treble (2018), the only women's volleyball club in Greece to have won a European title. They hold the records for winning nine consecutive national Cups (2011–2019) and six consecutive Doubles (2013–2018). The season 2017–18 was the most successful in the club's history and the most successful by any Greek women's volleyball club in history; besides winning the aforementioned CEV Challenge Cup in their second final presence in a row, they won the domestic competitions undefeated, with 25–0 wins in the League, finishing the season with only two sets lost in an unprecedented 75–2 set record, and 4–0 wins in the Cup with a 12–1 set record, achieving a Continental Treble and their sixth consecutive domestic Double. In the same season, the men's volleyball team reached the CEV Challenge Cup final and Olympiacos became the first volleyball club that had men and women playing simultaneously in European finals, and one of the very few to have won European trophies in both departments. Olympiacos women's basketball team was initially founded in 1947, being one of the best women's basketball clubs in Greece during the 1950s and the early 1960s, when they won 3 Women's Division Center Championships (1956, 1958, 1959), which was the most important competition of Greek women's basketball at the time (until 1967–68 when the Greek Women's Basketball League was officially organized). The department was dissolved in the mid-1960s and after a long period of inactivity, it was reorganized in 2015. In 2015–16 season, which was the first after its reorganization, Olympiacos won the double undefeated; they won the Greek League with 22 wins in 22 matches, sweeping arch-rivals Panathinaikos with 4–0 wins in the finals and also clinched the Greek Cup title, beating Panathinaikos once again in the final (63–60). They managed to repeat this achievement in 2016–17 and 2017–18 seasons, thus winning three consecutive undefeated Doubles with 84 straight wins in both the Greek Championship and the Greek Cup. Olympiacos men's handball department was founded in 1931 and it has won 1 Greek Handball Championship, 2 Greek Cups and 1 Double. In 2017–18 season, which was the first after its reorganization, Olympiacos won the domestic double. They won the Greek Handball Championship by beating AEK Athens with 3–2 wins in the finals in a dramatic fashion, as they overturned an initial 0–2 win lead by AEK and took three straight wins to secure the League title. They also won the Greek Cup, beating PAOK in the semi-final and ASE Douka in the final to complete the domestic Double. Winners (6): 1971, 1972, 2003, 2004, 2005, 2008. The history of the Karaiskakis Stadium and Olympiacos was marked by the worst tragedy that ever hit Greek sports, known as the Karaiskakis Stadium disaster. On 8 February 1981, Olympiacos hosted AEK Athens for a League match, which ended 6–0, in an unprecedented triumph for the host team of Piraeus. During the last minutes of the game, thousands of Olympiacos fans at the Gate 7 rushed to the exit, to get to the stadium's main entrance and celebrate with the players, but the doors were almost closed and the turnstiles still in place, making the exit almost impossible. As people continued to come down from the stands, unable to see what happened, the stairs of Gate 7 became a death trap; people were crushed, tens of fans were seriously injured and twenty-one young people died, most of them by suffocation. In memory of this event, every year on February 8, there is a memorial service at the stadium in honor of the supporters that died in that incident. The service is attended by thousands of fans every year, who are rhythmically shouting the phrase "Αδέρφια, ζείτε, εσείς μας οδηγείτε." (Adhélfia, zíte, esís mas odhiyíte, "Brothers, you live, you are the ones who guide us."). At the tribune part of the stadium where Gate 7 is now, some seats are colored black instead of red, shaping the number "7", whereas there is also a monument on the eastern side of the stadium, bearing the names of all 21 supporters killed on that day in the stadium. Even though this incident affected almost solely the fanbase of Olympiacos, other teams occasionally pay their respects to the people killed as well, as they consider the incident to be a tragedy not only for one team, but for the whole country. In the past, even foreign teams, such as Liverpool F.C. and Red Star Belgrade have honored the incident's victims. Hall of Fame coach Ivo Trumbić led Olympiacos to the 1971 title. ^ "Olympiacos clinch 40th Greek title". UEFA.com. Retrieved 27 May 2013. ^ "CEV Cup (Top Teams Cup) 1995/96 Olympiacos Piraeus (GRE) - SV Bayer Wuppertal (GER) 3:2 (Final)". volleyball-movies.net. ^ Όταν σήκωσε και το Ευρωπαϊκό το 2002 (in Greek). redplanet.gr. Archived from the original on 3 March 2013. Retrieved 25 May 2012. ^ Οι Ευρωπαϊκές κούπες (in Greek). redplanet.gr. Retrieved 18 December 2012. ^ Βουλιαγμένη – Ολυμπιακός 7–8 (in Greek). sport24. Retrieved 25 May 2013. ^ a b "Οι 15 διεθνείς τίτλοι του Ολυμπιακού". ^ "Women's team of Olympiacos Piraeus wrote a piece of history for one of Europe's most decorated multi-sport clubs". European Volleyball Confederation (CEV). 9 March 2017. ^ "CSKA Moscow, FC Barcelona and Olympiacos CFP the greatest multi-sport clubs in Europe". fosonline.gr (in Greek). 14 April 2018. ^ "Olympiacos 15 International titles". gavros.gr (in Greek). 10 June 2018. ^ "Μην μπερδεύεστε, 15 είναι οι διεθνείς τίτλοι του Θρύλου". gavros.gr (in Greek). 10 June 2018. ^ "Olympiacos' 12+2 International titles". sport24.gr (in Greek). 12 April 2018. ^ "Olympiacos CFP: "Red Magic" in Europe". redking.gr (in Greek). 12 April 2018. ^ "The twelve international titles of Olympiacos" (in Greek). redplanet.gr. Retrieved 27 April 2015. ^ a b c d "Olympiacos repeats as Euroleague champion". EUROLEAGUE.NET. Retrieved 14 May 2013. ^ "Olympiakos is the new Intercontinental Champion, By George Georgakopoulos - Kathimerini". ^ "Intercontinental Cup: Olympiacos lifts new trophy". EUROLEAGUE.NET. Retrieved 6 October 2013. ^ "Coppa dei Campioni (Results)" (in Italian). cnposillipostory.net. Retrieved 20 April 2013. ^ "Έγραψε ιστορία, Champions League μέσ' στην Ιταλία! (pics & vids)" (in Greek). Retrieved 2018-06-09. ^ "Olympiacos wins LEN Trophy". waterpoloworld.com. ^ "Archived copy". Archived from the original on 2015-10-03. CS1 maint: Archived copy as title (link) "την πρώτη θέση στο Κύπελλο Ευρωπαϊκής Ομοσπονδίας (Cela Cup) που διεξήχθη στην πόλη Σρέτζανιν της Σερβίας κατέκτησε η ομάδα ελληνορωμαϊκής πάλης του Ολυμπιακού" (in Greek). nooz.gr. 4 December 2006. ^ "Η πρώτη κούπα της χρονιάς (pics)". ^ "Ο Ολυμπιακός κατέκτησε και το Σούπερ Καπ Ευρώπης, νικώντας 10-6 την Πάντοβα, κάνοντας το τρεμπλ για πρώτη φορά στην ιστορία του τμήματος" (in Greek). sport24.gr. Retrieved 27 November 2015. ^ "Μαγικό, θρυλικό και ιστορικό τρεμπλ!". ΟΛΥΜΠΙΑΚΟΣ Σ.Φ.Π. Retrieved 2018-04-30. ^ Έγραψε ιστορία ο Θρύλος (in Greek). sport.gr. Archived from the original on 13 December 2013. Retrieved 18 December 2012. ^ Έγραψε ιστορία ο Ολυμπιακός - Πρωταθλητής Ευρώπης στο πόλο γυναικών (in Greek). express.gr. Retrieved 27 April 2015. ^ "Imperia ladies take European Super Cup". waterpoloworld.com. Retrieved 26 May 2014. ^ Οικογένεια ο Θρύλος στο Ρίο. Από τα 97 μέλη της Ελληνικής αποστολής, οι 22 προέρχονται από τον Ολυμπιακό, ενώ συνολικά 30 είναι οι εκπρόσωποι του Ολυμπιακού στο Ρίο. redder.gr, (in Greek). 5 August 2016. ^ Ευχές από την ΠΑΕ στους αθλητές του Ολυμπιακού στο Ρίο. www.gazzetta.gr, (in Greek). 6 August 2016. ^ Η μεγάλη οικογένεια του Θρύλου στους Ολυμπιακούς αγώνες του Ρίο. Olympiacos FC official facebook account, (in Greek). 6 August 2016. ^ "Concentration of people supporting the most popular club (page 41), Greece: Olympiacos 26%" (PDF). UEFA sixth club licensing benchmarking report on European club football. UEFA. 2014-04-17. Retrieved 2014-04-20. ^ Βαμμένα Κόκκινα....Μυαλά - Απίστευτη η υποστήριξη του Ολυμπιακού εντός ελληνικών συνόρων καθώς οι "Ερυθρόλευκοι" βρίσκονται στην ενδέκατη θέση σε ολόκληρη την Ευρώπη από πλευράς δημοφιλίας ενός συλλόγου στη χώρα του (in Greek). "GOAL" newspaper. 2014-04-19. ^ "Portugal celebrates as Benfica smashes world record". AIPS website. 2006. Retrieved 2009-02-05. ^ "History of Olympiacos". Retrieved November 21, 2014. ^ Η Ιστορία του Ολυμπιακού (in Greek). olympiacos.org. Retrieved 30 September 2012. ^ "Olympiacos FC History". olympiacos.org. Retrieved 30 April 2013. ^ "Olympiakos (Greece)". Soccer Anthems. Retrieved 24 January 2012. ^ "Olympiacos, a true Greek legend". fifa.com. 7 October 2011. Retrieved 22 November 2018. ^ "Trophies". olympiacos.org. Retrieved 5 May 2013. ^ "Οι ομάδες με τους περισσότερους τίτλους στον κόσμο, 9ος ο Ολυμπιακός" (in Greek). sport24.gr. 10 May 2018. Retrieved 22 November 2018. ^ "Μπλάτερ για Ολυμπιακό: Τι επίτευγμα!" (in Greek). sport24.gr. 28 April 2015. Retrieved 29 April 2015. ^ "Unbeaten". rsssf.com. Retrieved 20 September 2015. ^ "This is the new legendary shirt!". olympiacos.org. 7 August 2013. Retrieved 8 August 2013. ^ "Club coefficients". UEFA. Retrieved 22 November 2018. ^ "New era in European game". UEFA. 22 January 2008. Retrieved 29 May 2013. ^ "Balkan Cup". rsssf.com. Retrieved 22 November 2018. ^ "2nd Balkan Cup 1961/63". www.rsssf.com. ^ "EPO - Hellenic Football Federation". www.epo.gr. ^ "Supercup - Champions". worldfootball.net. ^ "Olympiacos repeats as Euroleague champion". Greekreporter.com. Retrieved 28 March 2015. ^ "Rome 1997: Time for the Reds, Olympiacos 73–58 FC Barcelona". EUROLEAGUE.NET. ^ "McDonald's Championship, Michael Jordan and the Chicago Bulls playing against Olympiacos Piraeus in the McDonald's Championship in Paris, 1997 (photo)". hoopedia.nba.com. Retrieved 10 May 2013. ^ FC Barcelona (8 January 2011). "Olympiacos, from a quiet start to a bold finish: Olympiacos, the best team of the 90s according to FIBA is one of the teams in the hunt for European glory". FC Barcelona official website. Archived from the original on 4 March 2016. Retrieved 5 September 2012. ^ Euroleague Greece (8 January 2011). "In the end of the 1990s FIBA found the Best European Team of the decade. It was Olympiacos, who was counting the 1997 Euroleague Title, two Euroleague Finals in 1994 and 1995 and the 3rd place in the 1999 Euroleague Final Four". Euroleague Greece official website. Archived from the original on 2015-05-14. Retrieved 12 May 2015. ^ "2011–12 season, Final Four". EUROLEAGUE.NET. ^ Naftemporiki (10 June 2013). "Μπάσκετ: Ο Ολυμπιακός κατάκτησε το Διηπειρωτικό Κύπελλο". ^ "Βόλεϊ Ανδρών - Σύντομο Ιστορικό Τμήματος" (in Greek). Olympiacos CFP. Retrieved 7 December 2018. ^ "Sports 123: Volleyball: Men: CEV Cup". sports123.com. ^ Predstavljamo Olympiacos (in Croatian). VK Jug official website. Retrieved 22 January 2019. ^ Αποθέωση του πρωταθλητή Ευρώπης Ολυμπιακού από τους Κροάτες (in Greek). fosonline.gr. Retrieved 21 January 2019. ^ Όταν η Ευρώπη υποκλίθηκε στον Ολυμπιακό (in Greek). onsports.gr. Retrieved 14 June 2012. ^ Ύμνοι για τον Πρωταθλητή Ευρώπης Ολυμπιακό (in Greek). gavros.gr. Retrieved 21 January 2019. ^ "Έγραψε ιστορία, Champions League μέσ' στην Ιταλία! (pics & vids)". ^ "Olympiakos wins European crown in women's water polo". ekathimerini.com. Retrieved 26 April 2015. ^ "Olympiakos's women win water polo's LEN Trophy". ekathimerini.com. April 5, 2014. Retrieved 6 April 2014. ^ "Balzan to ref women's Super Cup final". timesofmalta.com. Retrieved 10 April 2013. ^ "Olympiakos takes bronze in women's Champions Cup". ekathimerini.com. ^ "Women's LEN Trophy 2009 Semifinals Results". fsn.ch. ^ "Home victories, but no decisions in LEN Trophy semifinals". waterpoloworld.com. ^ "Olympiacos wins Euro League after thrilling final". waterpoloworld.com. Retrieved 26 April 2015. ^ "El Sabadell cae tras una racha de 115 encuentros sin perder" (in Spanish). as.com. Retrieved 26 April 2015. ^ "Πρωταθλητής Ευρώπης ο Ολυμπιακός!". ^ "Το έκτο αστέρι στον Ολυμπιακό με ρεκόρ 75-2 σετ!" (in Greek). novasports.gr. 30 April 2018. Retrieved 1 May 2018. ^ "«Ερυθρόλευκα» ρεκόρ στο τρεμπλ των γυναικών!" (in Greek). gazzetta.gr. 1 May 2018. Retrieved 1 May 2018. ^ "CEV - Confédération Européenne de Volleyball". Cev.lu. Retrieved 2018-11-29. ^ "Ιστορικό τριπλ κράουν ο Ολυμπιακός, 3-0 τον Άρη". ^ "Γυναικείο Μπάσκετ Ολυμπιακού" (in Greek). redsagainsthemachine.gr. Retrieved 27 August 2015. ^ after absorbing Elliniko-Sourmena B.C. ^ Ολυμπιακός και με τη… βούλα στο γυναικείο μπάσκετ! ^ "Θρύλος και στο Μπάσκετ Γυναικών" (in Greek). gavros.gr. Retrieved 27 August 2015. ^ "Olympiacos undefeated Greek Champions 2016-17" (in Greek). osfp.gr. Retrieved 29 April 2017. ^ "Championship again in Piraeus!". ΟΛΥΜΠΙΑΚΟΣ Σ.Φ.Π. (in Greek). Retrieved 2018-05-13. ^ 84-0 και συνεχίζει. gavros.gr (in Greek). ^ "Olympiacos 2017 Greek Cup winners" (in Greek). osfp.gr. Retrieved 29 April 2017. ^ "And the cup again in Piraeus!". ΟΛΥΜΠΙΑΚΟΣ Σ.Φ.Π. (in Greek). Retrieved 2018-05-13. ^ Olympiakos win Greek Handball Cup. handball-planet.com. 14 March 2018. ^ "Η αυτοκρατορία μόλις ξεκίνησε για τον Ολυμπιακό!". ^ "Τρεμπλ για τον Θρύλο και στην Κολύμβηση". ^ "Κυρίαρχος παντού ο Θρύλος του παγκόσμιου αθλητισμού". olympiacossfp. ^ "Με απίστευτη ανατροπή, το 11ο πρωτάθλημα στον Πειραιά". Olympiacos official website. Retrieved 2017-06-18. ^ "Πρωταθλητής και στον Ανοιχτό Στίβο ο Θρύλος". ^ "Ξανά Πρωταθλητής ο Θρύλος". Olympiacos official website. Retrieved 2018-02-11. ^ "Πρωταθλητής ο Ολυμπιακός!". olympiacossfp. ^ "Gate 7". Olympiacos.org. Retrieved 25 August 2013. ^ "Velodrome and Karaiskakis Stadium (1895–1964–2003)". www.stadia.gr. Retrieved 2009-01-03. ^ "Karaiskaki Stadium History". olympiacos.org. Retrieved 2013-05-28. ^ "The Gate 7 Tragedy". thekop.liverpoolfc.com. Retrieved 2013-05-28. ^ "Ivo Trumbic inducted into Swimming Hall of Fame". waterpoloworld.com. Retrieved 7 February 2015. Wikimedia Commons has media related to Olympiacos C.F.P.. This page was last edited on 20 April 2019, at 14:18 (UTC).